Hi all! Hope you’re having a great Tuesday! I am on the home stretch of the boys being in school so we are gearing up for a fun and busy summer. I’m pretty excited right now but give me a couple of weeks and I’m sure I’ll be ready for the boys to get back into a routine. 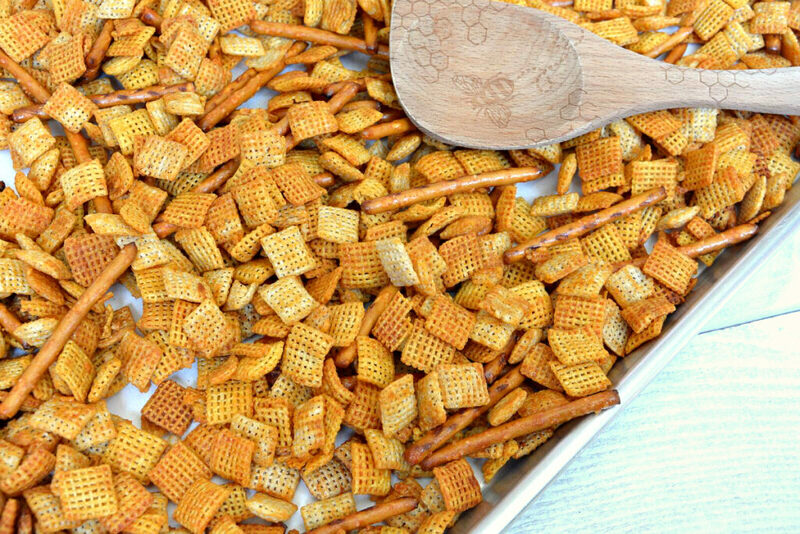 So about a week ago I tested out this Chex mix recipe. I had a quick hour before I had to pick up the boys from school so I decided to give it a whirl! I have to admit that my first batch burned. 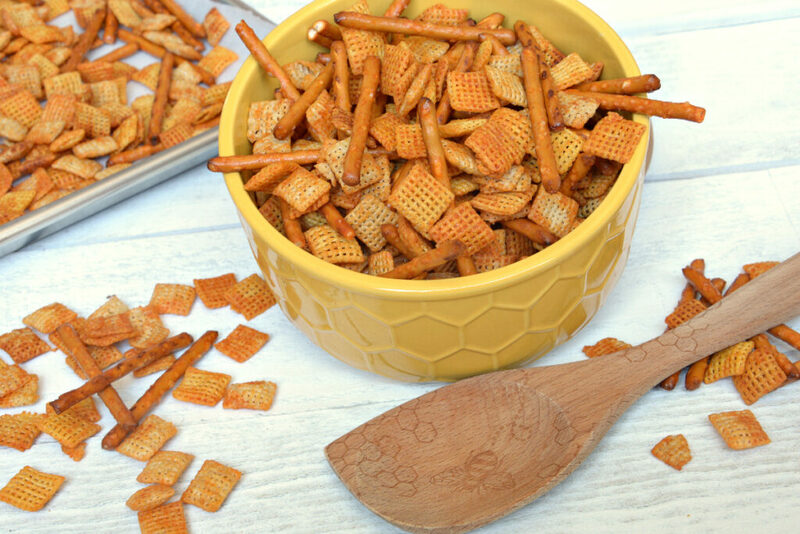 This was my first time making any type of Chex mix even though I watched my mom do it a million times growing up. I just wasn’t sure it was quite done until I started to see a little smoke! Oops! But no big deal! It was easy to get another batch going and give it another go! The second time around I only microwaved it for 5 minutes which seemed to be the perfect time. I threw them in several baggies and off I went to school pick up! Can I just say that they were a HUGE hit?! There are about 5 moms or dads that usually stand around waiting for their kiddos to get out and I knew that would be the perfect test group. They completely devoured them and I thought they were going to wrestle me to the ground because they wanted more! I have found that this is such a quick and easy recipe that I started to crave on a weekly basis. So I try to have some throughout the week. Perfect for baseball games, parties and apparently for the parents at school pick up! **You can easily adjust the Sriracha to your liking. The amount of Sriracha in the recipe is a good happy medium but you can increase or decrease the heat if you’d like! Enjoy! 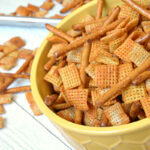 Easy snack idea that has the perfect amount of heat and sweet! 1 Cup Roasted Salted Peanuts honey roasted would work too! 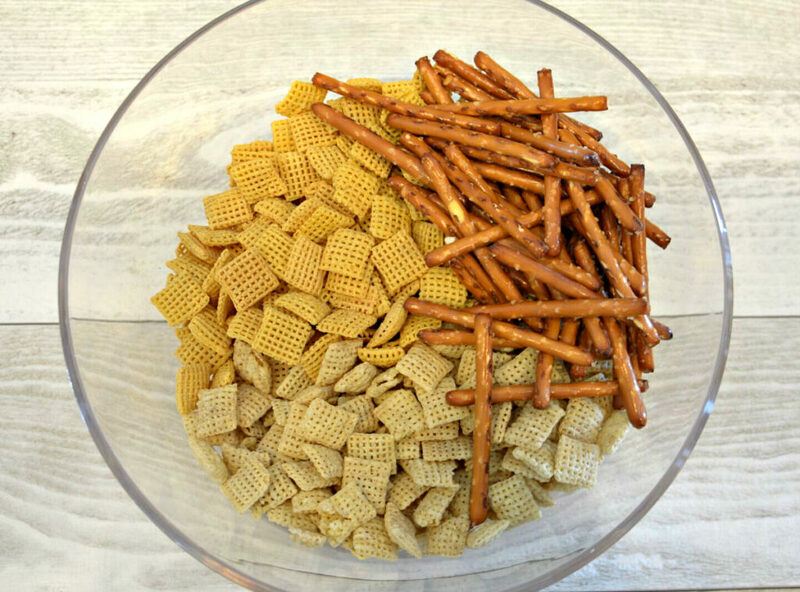 In large microwave bowl, mix cereals, peanuts and pretzels; set aside. In small microwave bowl, melt butter. Once melted stir in Sriracha sauce and honey. Pour sauce mixture over cereal mixture; stir until evenly coated. Spread on wax paper to cool, about 15 minutes. Store in air tight container!